For just a few times since its pillars were first installed in 1912, the Hope College arch is conspicuously missing from its place outside Graves Hall. 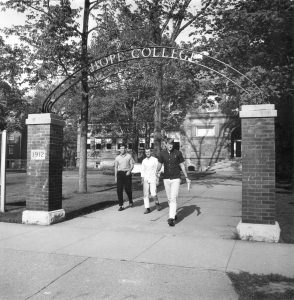 The Hope College arch is a landmark around campus. Its brick pillars were donated by the Class of 1912, and the decorative metal arch, which includes the words Hope College, was added in 1940 as a gift from the Hope College chapter of the national Blue Key honor society. The arch was meant to serve as a symbol of Hope, donated during a time when the college had few true landmarks by which it could distinguish itself. Today, the Hope College Anchor stands outside of Graves Hall, statues and plaques litter campus, and some college buildings have come into their own rights as historical landmarks. However, the archway has endured as a Hope College icon and remains one of the most recognizable features around campus. The last time it was absent was the summer of 2006, when it was removed to repair damages sustained during a June 6 delivery truck collision. The repair took five weeks, and the arch returned to campus on July 13, 2006. Now, nearly eleven years later, a delivery truck has proved to be the enemy of the arch yet again. After another unfortunate collision, the brick pillars and bronze arch have been removed for repairs. Upon removal, the arch and the pillars were shown to have sustained significant damage from decades of weather related wear and tear. The entire structure will be replaced in order to ensure many decades more of enjoyment and recognition. The date of the arch’s return is yet unknown, but it’s safe to say that before long, the Hope icon will be back in its rightful place, an everyday sight as students pass between Van Wylen Library, A. Paul Schaap Science Center, and Graves Hall.